Proposed Conference Publication: LSP Vectors: Strengthening Interdisciplinary Connections. Co-Editors: Mary E. Risner & Sheri Spaine Long. 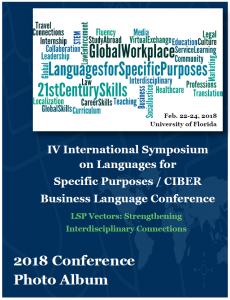 The fourth International Symposium on Languages for Specific Purposes (ISLSP) is hosted by the Center for Latin American Studies at the University of Florida and the Centers for International Business Education and Research (CIBERs). The conference brings together educators, administrators, students, and language policy makers worldwide from all levels. 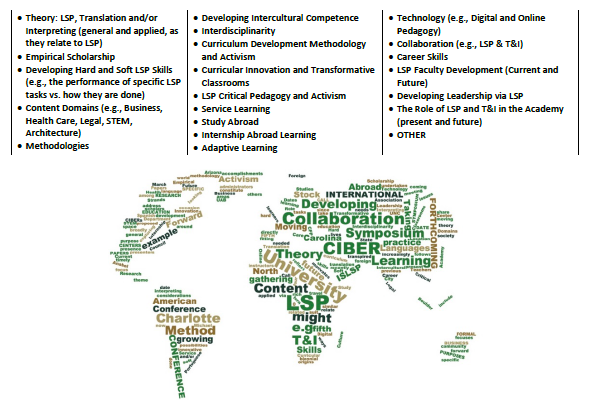 The purpose of the conference is to share innovations and visions of a future where LSP is a standard and integral component of the curriculum. Individuals seeking knowledge on interdisciplinary curriculum design, LSP program development, LSP theoretical and applied research, and pedagogical approaches should attend.